Bottle Gourd or Sorakaya may be good for health but nobody likes it. It is completely Andhra recipe. This curry is a best accompaniment with rice. Peel the skin and cut bottle gourd into cubes. Add salt and turmeric powder to bottle gourd pieces and pressure cook for three whistles. Drain excess water through a colander. Heat oil in a kadai, add mustard seeds, cumin seeds and red chilli pieces. When they start spluttering add curry leaves. Add boiled sorakaya pieces. Soak rice for half an hour, add mustard seeds, chilli powder, coconut, soaked rice and sesame seeds in a blender jar. Blend it and make smooth paste of it. Add tamarind juice, salt and turmeric powder. Take care while adding salt as we have already added during pressure cooking. Let it boil for a while. Once the vegetable pieces started boiling in tamarind juice, add above grounded mustard masala. Allow this also to boil for 2 to 3 minutes. 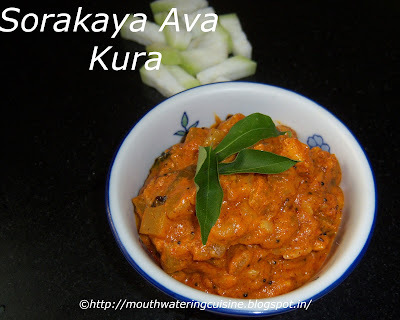 Serve hot spicy sorakaya ava kura with rice.